Computer get’s slowdown when we start using many Programs Simultaneously or due your to processor Configuration.Many times when you want to finish your work your computer get’s Hang up and get stuck so you are unable to use it for some period of time.Now we have to minimize CPU Usage of my background Program and Utilizing most of the CPU resource for my current Program.So that My current Program will work Smoothly and Fast. Even this Process will help in Energy Saving and also Beneficial for Gamer So that most of the CPU resource will be Utilized for Game. 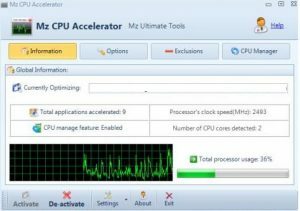 Mz CPU Accelerator will make your PC application Run faster then before and one of the most powerful tool for accelerating your CPU without any harm because their are many ways to accelerate CPU specially OverClocking which can cause CPU Over heating and can damage your computer. Mz CPU Accelerator is Specially Developed to change their Priority Automatically by allocating more power to the processes which are currently active. 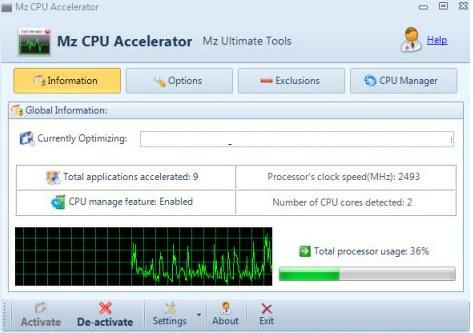 Use Mz CPU Accelerator and sure you will notice improvements in your Windows PC. 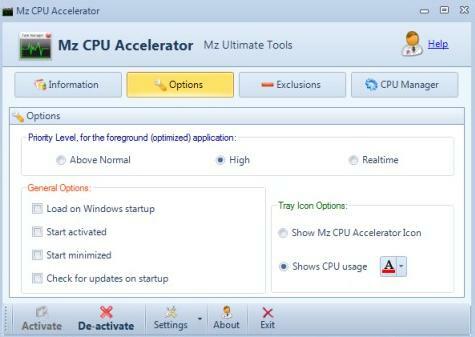 All functions of Mz CPU Accelerator can be done Manually in Task Manager But major advantage of Mz CPU Accelerator is it changes Priority of your Processes automatically.